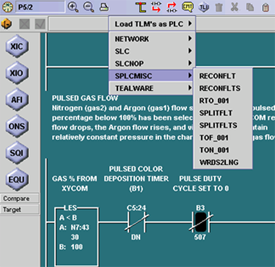 TOPDOC® NexGen is the programming software for SoftPLC. TOPDOC's history of nearly 30 years usage by many thousands of PLC users ensures not only robustness, but also a comprehensive and powerful set of functions for both PLC program developers and maintenance personnel. TOPDOC® NexGen makes SoftPLC® programming and continued maintenance fast and easy. The sleek user interface design means both infrequent and "power" users have the features and functions they need. TOPDOC provides a comprehensive APP editor for both remote (online) and local (offline) use. Within the APP editor you can create/modify ladder logic, data table, and program documentation. You can create programs offline, then download them to your SoftPLC's. You can also work directly online connected to a SoftPLC to create, monitor, and modify programs. TOPDOC also automatically learns if the connected SoftPLC includes any user loadable instructions (TLI's), and adds them to the instruction menus. TLI's can also be programmed offline. SoftPLC application programs can include extensive text documentation, so programs can be easily understood and maintained. All documentation is included the single APP file (which includes logic, data table, and all documentation), which means you have only one file to backup and keep track of! Rung comments are virtually unlimited in size. The first line of a rung comment can also become a searchable "subtitle" in a program. 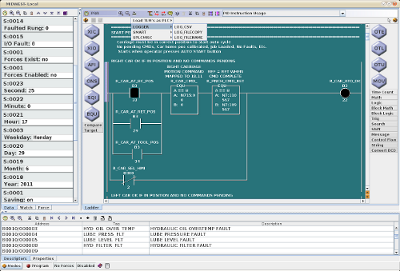 Program subroutine files and data table files can be documented with short and long descriptions. Data Table address descriptors include a tagname and a long description. Descriptors are edited in a spreadsheet style interface, or can be easily created/edited in an external program and pasted into TOPDOC's APP editor. A Ladder Diagram Report and Data Table Report can be printed, including to .PDF format. The Properties Editor makes it easy to edit property file entries, also using a spreadsheet style user interface. Property Tables are a RAM-resident database in SoftPLC that are useful for sorting, warehouse, and recipe-oriented control applications. Search by address, tagname, instruction, or instruction/address combination. You can search by direct reference or with wildcard specifications. A "Find All" function provides a list of all usages, search results are retained for an easy "trace" function capability. TOPDOC includes a complete SoftPLC configurator which is used to set up TCP/IP and serial communications parameters, select and configure TLM's (I/O drivers and loadable functions), set start-up parameters, and more. The PLC Configurator makes it easy to map other vendor's I/O to a SoftPLC system, such as ModbusTCP, DeviceNet or Profibus. A "Detect on Net" function makes it easy to see which SoftPLC's are on the network, and to perform an easy configuration backup of all PLC's. TOPDOC NexGen is available for Windows or Linux operating systems. Updated quick reference guide on installing TOPDOC NexGen for Win7/Win8/Win10. User Guide includes SoftPLC installation & configuration, communications driver setup, and describes how SoftPLC operates, common troubleshooting techniques, etc. Detailed programming, instruction set, and software usage is in the online help system. Allows use of all offline features, but no online. Contact SoftPLC Sales for the unzip password. It is strongly recommended that you download and read this guide prior to installing TOPDOC NexGen. Java runtime environment. Only required if your system does not already have a 32 bit JRE installed. Zipfile of demos to run locally on your system. PLC Configuration Tools - How to set up PLC communications, I/O drivers, etc.